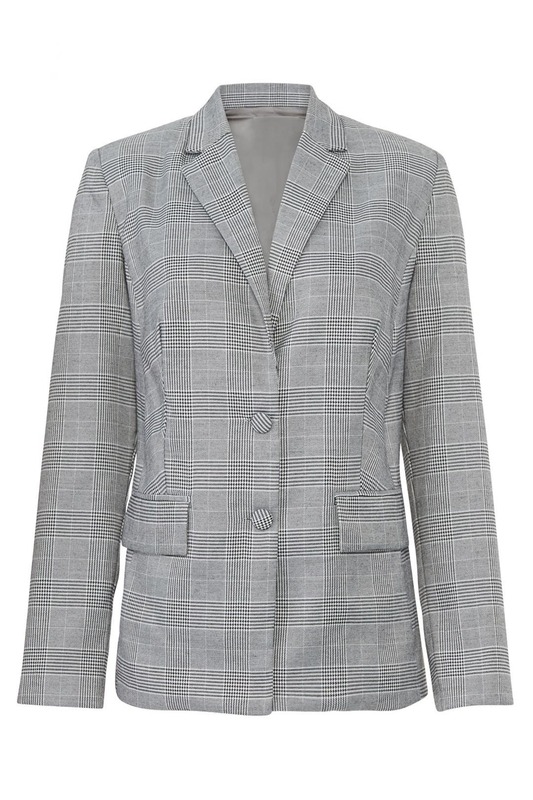 This tailored glen plaid blazer by The Jet Set Diaries is perfectly polished for the office and cool enough to wear with casual denim. Pair with the Black Kiltie Earthette Bag by ZAC Zac Posen to add some classic edge. Grey printed crepe (98% Polyester, 2% Spandex). Blazer. Long sleeves. Fully lined. Front pockets. 29" from shoulder to hemline. Imported. 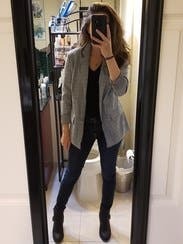 I was hoping to wear this jacket with a work dress. However, it was too long and boxy. 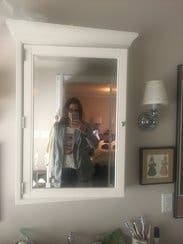 I am 5'4 and this jacket was almost as long as my dress. I could only possibly wear this jacket with pants. It is not fitted at all. It just didn't work with my outfit. I wore this to work. I got my usual size (small) but definitely should've sized down. It fit oversized but comfortable. Not structured. Fun and professional print. Could be dressed up or down. It has a bit of a retro feel. Probably won't rent again. I had a impression this jacket would be structured. However, the material is thin like a shirts, easy to get wrinkled, and shapeless. Not something I wanted. I just tried on and had to return it. The blazer runs large but its super cute and can easily be dressed down or up. Very comfortable for work. I wore a S but I think an XS would've fit better in the shoulders. Definitely has an overall relaxed feel. 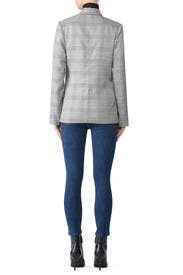 I wanted to love this jacket and it is a great option, but it is not very fitted. On me, it was longer in the front and shorter in the jacket. It fit well through the shoulders, but was big through the body. I styled it with a black tee, dark jeans and a slip on sneaker. This blazer was pretty and the quality of materials seemed great. However, when I put it on- I felt like I was wearing my husband's blazer. It was big in a bulky way. Size down! loved the fit and goes with anything! Definitely boxy so size down or embrace the relaxed style. Cuff the sleeves, wear some leggings and enjoy! Wanted to love but even the XS fit very big. Great trendy piece to try! I love the look of plaid jackets this season, and this fits the bill. 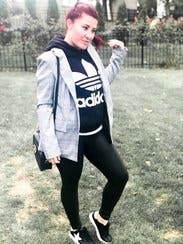 I wore with cigarette pants and heels for a nice business- casual look. This piece is very versatile. A great option for anyone. Fit is amazing. Works for so many different outfits. I may end up purchasing. Really oddly shaped, and very unflattering. Huge. Did not make it out of the bathroom. 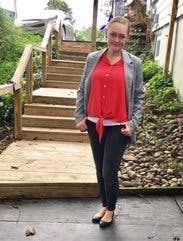 I loved the look of this blazer and since it is oversized I could have sized down. It was a little big in the shoulders. I loved it though. Great material and super cute! I typically wear an XL or a 1X in a jacket and this was an L, which I rented because reviewers said that it ran larger than normal. I would agree with that, but it was still a bit too small for me. Smart looking and comfortable. On Trend but fit weird. very large- sleeves were right for a medium cut, but I swam in the chest and waist cut. Blazer is supposed to be boxy-cut, but this one just had too much material. 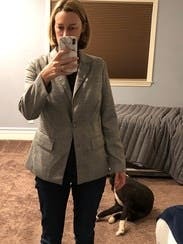 While I was going for a professional polished look, the size runs a little big so blazer wasn't as fitted as I would've liked. Understated but nice plaid. Unless you're tall, the sleeves will need to be rolled up. The lining is pale gray and looks good rolled. One of the buttons fell off in the first hour I was wearing it, but otherwise seems well made. 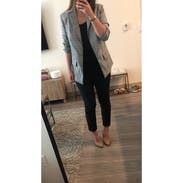 Easy to wear blazer for anyone. 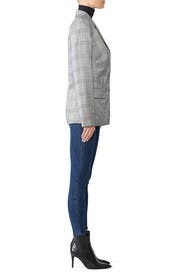 Found it to be true to size but if you have broad shoulders order up bc like most blazers it would be tight across your back. I decided to buy this blazer. I really like the lightweight feel. It is easy to wear with jeans, pants, and skirts. Really cute, but slightly big in the chest area. Great for work! Order a size down. 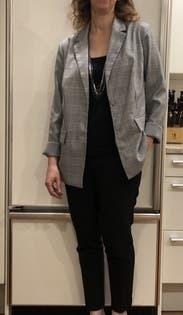 It definitely runs a bit big but I liked that it was more of a relaxed fit. I wore a plain white v neck underneath with black jeans and booties and felt super trendy.